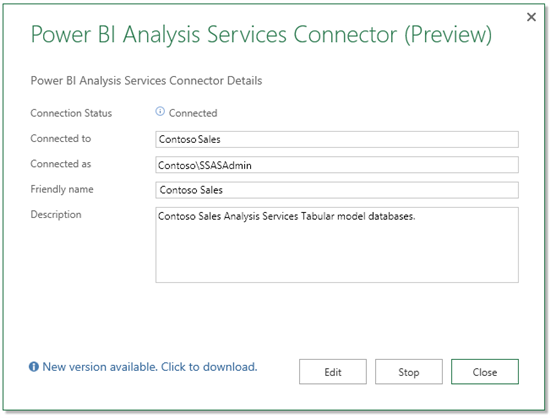 What’s new in the April release of the Analysis Services Connector? This is an in-place upgrade: if you already have the Connector installed, you do not have to uninstall it before installing the new version. Also, you do not have to reconfigure the Connector after installing the new version. 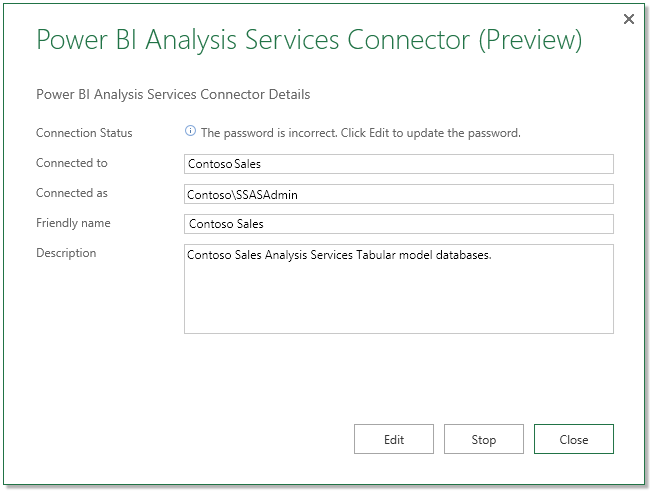 For example, we’ll validate whether the Power BI account can connect to the Analysis Services Server with the effective user name mechanism. If you get the error in the image below, it means that your Power BI username does not match your on-premises username. 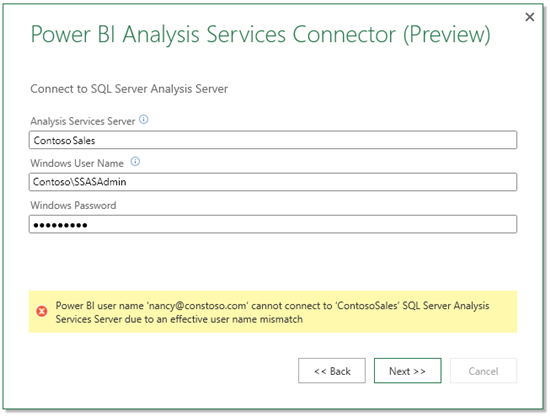 Hence the effective user name mechanism that Power BI relies on to connect to the Analysis Services Server could not work. To fix it, you’ll have to ensure you use your work email address with Power BI or your on-premises Active Directory is synchronized with Azure Active Directory. Learn more about the Analysis Services Connector to understand the role the effective user name plays & why the Active Director to Azure Active Directory sync is needed. You can now use the Analysis Services Connector within network environments which use proxy servers for HTTP connections. In the previous versions, if your organization’s network was using a proxy, under some situations, the Connector would fail to start up. This experience has now been improved. 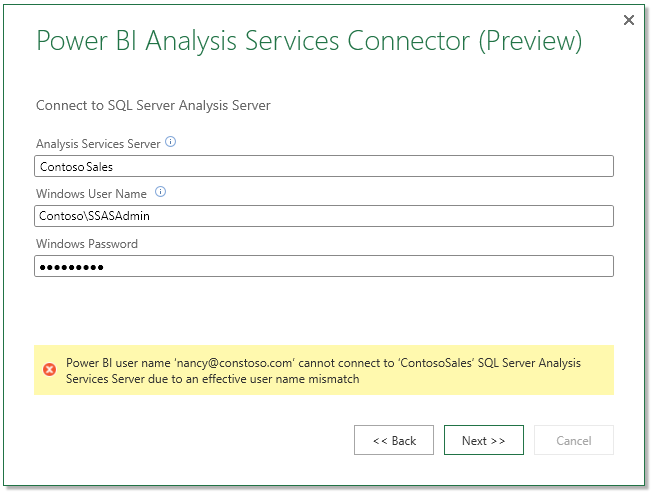 You will see a notification in the Analysis Services Connector when a new version is available for download. Click on the link to download & install the new version. You do not have to uninstall the previous version or reconfigure the Connector after installing the new one. d. Support for all languages Power BI is available in. a. 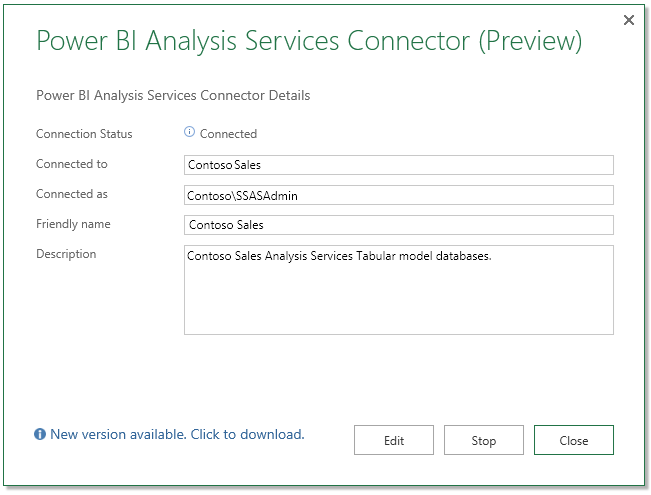 Improved error messages in the Connector and in the Power BI service to help you diagnose and fix issues. For example: When the password of a Windows user expires, you’ll see the following message in the Connector. You’ll also see a similar error message in the Power BI service when you try to connect to the dataset or open a report. To fix it, in the Connector click Edit and update the password. In addition, we have also taken care of several bugs reported. For example this one. We have receive lots of feedback for the Connector and we’ll continue to improve it. Stay tuned as updates roll out more frequently!